Acid attacks against women and girls are continuing despite legal campaigns to halt their spread. Over 2,600 cases have been reported since 1999, according to the Acid Survivors Foundation (ASF) of Bangladesh. Almost all the attacks have been on women or girls. Many of the victims are under 18, says ASF, which has been working to eliminate acid violence for almost a decade. The main reason for the violence is dowries, refusal of love proposals, or land disputes, ASF said. Bent on revenge, perpetrators throw acid into their victims’ faces in an effort to severely disfigure them, often with horrifying results. Nitric or sulphuric acid has a catastrophic effect on human flesh, ASF said, resulting in skin tissue melting, often exposing the bones below the flesh, and even dissolving bone. Scarred for life and badly burned, many survivors also lose their sight in one or both eyes. Others are so psychologically traumatised they never recover. 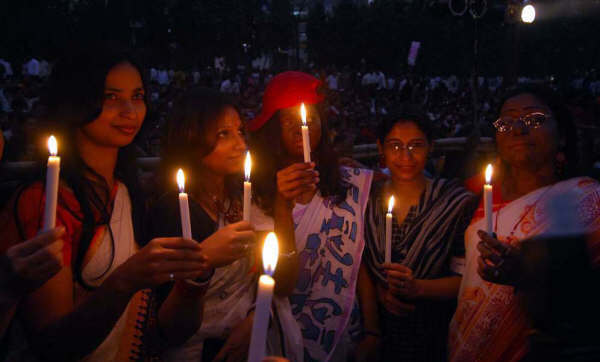 Women observe a candle light vigil on the night of International Women's Day in Dhaka. The government announced its National Policy on Women's Development on 8 March 2008. Despite the public outcry, purchasing acid is still not difficult. In Dhaka, sulphuric acid can be readily purchased for just 44 US cents a pound (roughly half a litre), with nitric acid slightly higher at 59 cents a pound. “You just ask the traders for acid. They will provide you with the required quantity,” Gopal Das, a goldsmith in the city’s Tantibazar area, said. Gopal uses nitric acid to melt gold. Since he only needs a very small amount he has never bothered to obtain the now mandatory license. Like Gopal, many jewellers, especially the small ones, collect and use acid, making effective monitoring of this deadly material all but impossible. “The last time a mobile court raided this area was March 2008,” said Kazi Abdul Hamid, a shop owner selling chemicals in Goal Nagar, an acid wholesale market in Dhaka. “We should have a distinct monitoring team to control acid use and sale; the fact is that we do not have one. Normally a mobile court visits specific shops and issues or renews their licenses. I can’t tell you when the last visit took place,” said Deputy Administrator of Dhaka Mohammad Zillar Rahman whose office is responsible for controlling and monitoring the acid trade in the city. “Enforcement remains weak. Perpetrators are still able to procure acid on the open market,” said ASF executive director Monira Rahman. Efforts to combat the crime have had limited success. A number of organisations are working to combat the crime, or mitigate its effects. ASF and the DMCH burns unit are working to support victims of acid attacks. BRAC (Building Resources Across Communities), Bangladesh’s largest NGO, offers survivors logistical assistance with access to health facilities. Legal aid organisations, such as Ain o Salish Kendra, and the Bangladesh National Women Lawyers’ Association provide legal aid to acid victims. Prothom Alo, a popular daily, raises funds for the treatment and rehabilitation of victims, as well as campaigning against the crime. According to rights groups, apart from Bangladesh, acid attacks are common in a number of Asian countries, including Pakistan, India, Afghanistan and Cambodia.